Interested businesses can opt into the program simply by identifying three (3) ways in which they cater to people travelling by bicycle (see the list of ways to participate here). Once you can identify three ways your business is Bicycle Friendly, all you need to do is apply for certification through the LADOT Bike Program. Once the LADOT Bike Program has received your application for certification, we will review your Bicycle Friendly Business qualifications and notify you within 30 days of the decision. 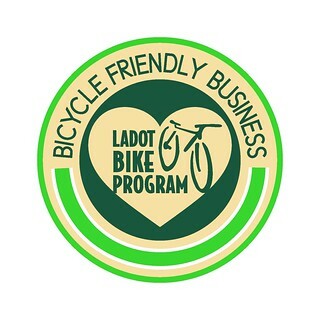 Upon approval, you will receive an official letter and a window cling that publicly promotes your location as an LADOT Bicycle Friendly Business. Your business will also appear in a Directory of Bicycle Friendly Businesses in Los Angeles. Certified Bicycle Friendly Businesses can display their participation in the program through a cling decal that can be adhered to a storefront window or door. As the citywide program participation grows, customers will be able to identify businesses that provide special services and deals to people riding bicycles. The BFB Directory provides business names, location, services, and bicycle-friendly amenities you provide. Beyond the Directory, businesses can feature Bicycle Friendly specials on the company homepage and promote your new status as a Certified Bicycle Friendly Business. Businesses can also promote and capture dollars of people travelling by bicycle through check-in specials and deals. Websites like Yelp.com facilitate the opportunity for businesses to advertise and offer both deals and check-in specials via smart phone apps. For example, when customers check in on their app, and have a bicycle or bike helmet, they can claim the advertised special at a business. A Bicycle Friendly Business could also be featured on blogs and websites that focus on specific neighborhoods. The more a business can do for people travelling by bicycle within the community, the more media traction it can generate on blogs and websites. Bicycle Friendly events, rides, and pioneering revolutionary Bicycle Friendly business practices provide great content for publishing online.